JIm Nwobodo and his wife Patricia, after 22 years of marriage in Anglican Communion, converted to the Catholic Church at the heat of the crisis over the burial of his son, Dr Ifeanyi Nwobodo. A former Governor of old Anambra State, Senator Jim Nwobodo, yesterday repelled pressures to coerce him back to the Anglican Church. Nwobodo, who was honoured by his former Church, the Anglican Communion Awkunanaw, said he would remain a Catholic, because it was the church that came to his help in time of difficulty. The occasion was the centenary celebration and thanksgiving of Christianity in Awkunanaw land held at St. Mathew Anglican Church, Amechi, Awkunanaw. Nwobodo built the church single handedly in 1982. At the service, which was conducted by the Archbishop, Enugu Ecclesiastical Province, Dr. Emmanuel Chukwuma, a galaxy of Catholic priests led by Monsignor John Amadi accompanied Nwobodo. Archbishop Chukwuma had told the congregation that by honouring the invitation to honor him, Nwobodo has finally returned to the Anglican Communion, which he left in 2015. Chukwuma admonished Nwobodo to consider the fact he single handedly built the church and for the fact that his father, late Pa Peter Nwobodo was one of the pillars of the church should make reconsider coming back. “Peter was one of the pillars of the church in Amechi and left it for his son Jim. Jim took up the challenge and built the church single handedly. His father, Peter will be happy today in his grave as his son Jim is back to the fold,” posited the Archbishop. He further told Nwobodo: “You are a baptized and confirmed Anglican. These Catholic priests that accompanied you to this occasion should bid you bye because you are not going back to Catholic again with them. But Nwobodo in his response told the congregation that the question of his returning to Anglican Church should be a matter for another day. 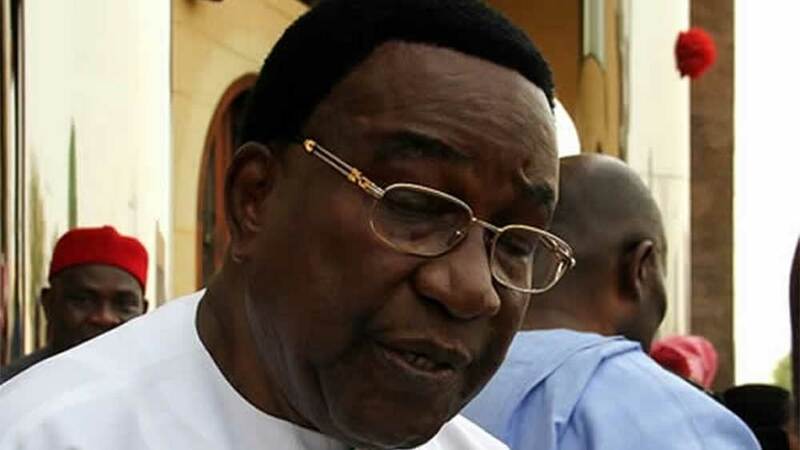 Nwobodo and his wife Patricia, after 22 years of marriage in Anglican Communion, converted to the Catholic Church at the heat of the crisis over the burial of his son, Dr Ifeanyi Nwobodo. Earlier, the Church had endorsed Governor Ifeanyi Ugwuanyi of Enugu State for reelection in 2019, saying that the governor deserves a second term because of his commitment to peace, good governance, love for the poor masses and development of the Church. Archbishop Chukwuma who made the endorsement while preaching a sermon at the Centenary Anniversary service commended Ugwuanyi for the good works he is doing in Enugu State and his uncommon leadership style that has restored peace, unity and good governance in the state, declaring that his re-election is “assured and not contestable” urging all other political parties including the All Progressives Congress (APC) to shelve party leanings to support the governor. He congratulated the governor for being in the saddle as Governor of Enugu State during the celebrations, saying, “good things are happening in Enugu State under Governor Ugwuanyi’s regime. “My dear Governor Ifeanyi Ugwuanyi, I congratulate you that you are the Governor of Enugu State and this is happening. Sometime ago, you were at Ngwo to celebrate our Diocesan Centenary Thanksgiving. Today, we are in Nkanuland for the same celebration. I am glad that good things are happening in Enugu State under Ugwuanyi’s regime,” the Archbishop said. Ugwuanyi who was conferred with an “Outstanding Leadership Award” by the Anglican Communion, in his address, felicitated with the Archbishop, the Archdeacon and all the Clergy and the Laity of the Awkunanaw Archdeaconry, on the historic event and equally thanked them for the award. The governor appreciated God’s faithfulness, special grace and compassion for everything his administration has been able to achieve in spite of the severe economic and other challenges confronting the country and prayed that with the continued support of the people, his government will not fail to deliver on its promise to take the state to a higher level of growth and development, for the benefit of all. “It is my prayer that God will continue to strengthen and empower this Archdeaconry, keeping it strong and progressive to the Glory of His Name,”the governor prayed.